TSPSC VRO Results, Ranking List Results, Merit List Results are announced 2018. TSPSC VRO Ranking List Results 2018 released @ tspsc.gov.in. TSPSC (Telangana State Public Service Commission) has released the merit list result/ ranking list results and other details of the VRO Recruitment examination held for selection of Village Revenue Officer (VRO) in Revenue Department. వీఆర్వో నియామక ఫలితాలను తెలంగాణ పబ్లిక్‌ సర్వీస్‌ కమిషన్‌(టీఎస్‌పీఎస్సీ) శుక్రవారం(మార్చి 1) విడుదల చేసింది. మొత్తం 693మందిని వీఆర్వో ఉద్యోగాల కోసం ఎంపిక చేసింది. రాష్ట్రవ్యాప్తంగా 700 వీఆర్వో పోస్టుల కోసం గతేడాది సెప్టెంబర్‌ 16న రాత పరీక్ష జరిగింది. మొత్తం 7,87,049 మంది అభ్యర్థులు ఈ పరీక్ష రాయగా, 7,38,885 ఉత్తీర్ణులయ్యారు. ఒక్కో ఉద్యోగానికి ముగ్గురిని ఎంపిక చేసి జిల్లాల వారీగా ధ్రువపత్రాల పరిశీలన చేపట్టి, చివరకు 693మందిని వీఆర్వో ఉద్యోగాలకు ఎంపిక చేసింది. The TSPSC VRO result for the same was released earlier on the official website. A message available on the official website of the TSPSC reads, " Now displaying the individual rank and other details. The entire General Ranking List will be displayed from 08/12/2018 onwards due to pressure on website/server on account of Election process." The TSPSC VRO Result, ranking list and other details are now available on the official website of the TSPSC - tspsc.gov.in. The candidates who have appeared for this recruitment exam can visit the official website of the Commission to check their result, ranking list and other details. The TSPSC had conducted the Village Revenue Officer exam on September 16, 2018, and the OMR sheet for the same was released on September 21, 2018. The answer key for the examination was released on October 16.. There are 700 vacancies to be filled in the VRO department of the state government. Notification in this regard was released in June and the application process was conducted from June 8 to July 2, 2018. Step 1: Go to the official website tspsc.gov.in. Step 2: On the home page, click on the activated link for TSPSC VRO Merit List Results. Step 7: Download your results and take a print and preserve it for future reference. 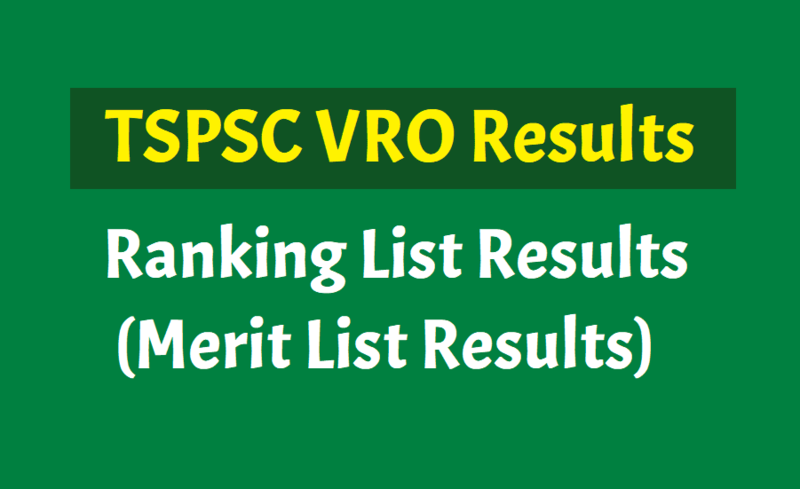 Step 2: On the home page, click on the activated link for "TSPSC VRO Merit List Result PDFs". Step 6: Download Ranking List PDF file and check your results.